A couple months back I wrote Add One Trendline for Multiple Series which shows how to add a trendline to a chart, and have the trendline calculated for multiple series in the chart. 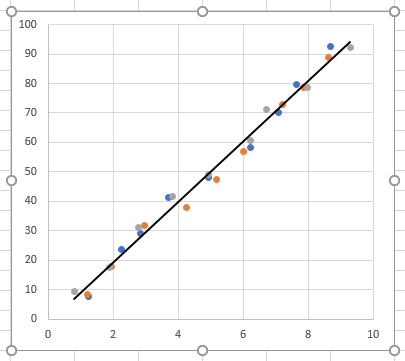 In fact, that tutorial was based on my answer to a question on Quora, How can I have multiple scatter plots and one trendline for all of them combined in Excel? Some Quora questions can be kind of lame, but this was a good one, especially if I’m getting a second blog post out of it. Feedback on that tutorial was positive, but it seems that people would like the process to be faster and simpler. Fair enough. So I decided to write a small add-in that automates the process. If you recall, the original problem was that we had three series of data in the chart, and we can easily get a trendline for any or all individual series, but we want a trendline that covers all points in all three series. You can download a workbook with my dummy data and charts here: MultiScatterTrendlineData.xlsx. This was the tedious step, adding all the data to a new series, and this is the part that my add-in will speed through. The multiple X value ranges are enclosed in parentheses, as are the multiple Y value ranges. What our code will do is count the series in the chart, read each series formula in turn, split out its arguments, and concatenate the separate X and Y values into combined X and Y values. 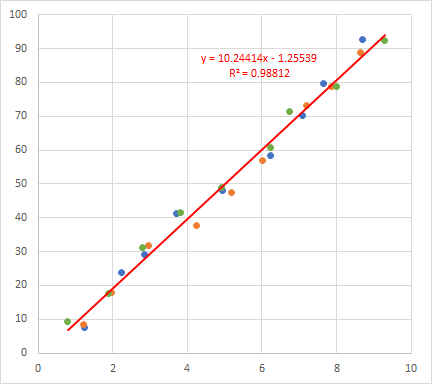 The code will then add the new series, apply the arguments of the series formula, hide the markers, and add a trendline. XAddress = XAddress & SeriesArgs(LBound(SeriesArgs) + 1) & ","
YAddress = YAddress & SeriesArgs(LBound(SeriesArgs) + 2) & ","
XAddress = "=(" & Left$(XAddress, Len(XAddress) - 1) & ")"
YAddress = "=(" & Left$(YAddress, Len(YAddress) - 1) & ")"
If you want to run this code, open the VB Editor (easiest way: use the Alt+F11 shortcut), find your workbook in the Project Explorer, and insert a fresh module (Insert menu > Module, or simply Alt+N+M). If the new module doesn’t say Option Explicit at the top, type it yourself, then go to the Tools menu > Options, and on the Editor tab of the dialog, check the box labeled Require Variable Declaration, and you may as well uncheck the box for Auto Syntax Check. I discuss why in a decade-old tutorial, VB Editor Settings. Skip a line after Option Explicit in your brand new code module, then copy the code from above, and paste it into the module. Before you run the code, select a chart. Then press Alt+F8 to open the Macros dialog. 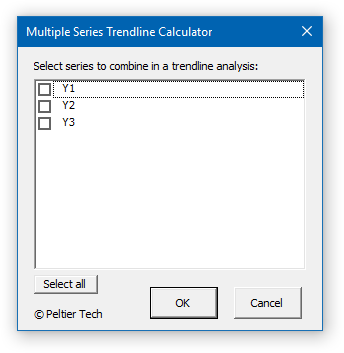 Select ComputeMultipleTrendline and click Run. In the blink of an eye, the new series is added, though it’s not visible, and the trendline appears. I used a solid black line, rather than the default dotted line Excel uses, because I think a solid line makes it easier to see. It doesn’t matter if all series use the same or different X values; the code doesn’t even compare the X values of the different series, it just puts them all into the series formula. I used the code above as the basis for my add-in. I added a custom ribbon tab named Multi Trendline with a custom button labeled Multi Scatter Trendline to invoke the code. I also designed a dialog so that you can select which series in the chart to include in your analysis (and which to exclude). where USERNAME is your Windows login. You can get there quickly by pressing Win+R (Win = Windows key), typing %appdata% in the Run box, and clicking OK, which opens the Roaming directory, and drilling down to Microsoft and then AddIns. Windows protects your computer from malicious software that came from a different computer than yours, but it also protects your computer from useful software that came from my computer, so you need to unblock the add-in. Right click on the add-in file in Windows Explorer, and choose Properties. At the bottom of the General tab of the Properties dialog, there may be a notice that the file may be blocked, and there is a checkbox to unblock the file. Check the box, and click OK.
Or you can use the old Excel 2003 shortcut, Alt+T+I to open the Add-Ins dialog. If you stored the add-in in the User Library, it will appear in the Add-Ins dialog as MultiScatter Trendline Calculator. Otherwise you will have to click Browse, then navigate to find the add-in. If you don’t want the add-in installed all the time, you can simply start it when you need it, using File > Open in Excel, double clicking in Windows Explorer, or dragging it from Windows Explorer and dropping it on Excel. Select a chart, then click the button on the custom ribbon tab. The dialog pops up. Select which series you want to include, and click OK. 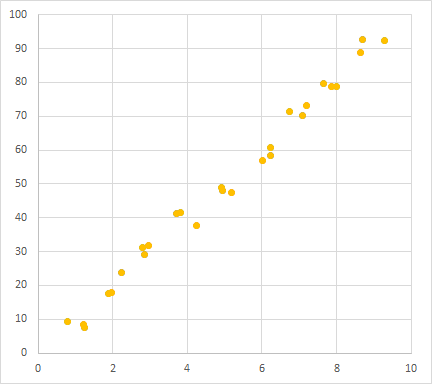 The series is added invisibly, and a trendline is added using Excel’s default settings. You can format this just like any other trendline, to change the fitting model used, to show the trendline formula on the chart, or to change the trendline’s formatting. I have left the add-in unprotected in case you want to see how it all works. There is XML code that handles the custom ribbon tab and button. There is code in a second module to handle clicks from the ribbon button. A UserForm (i.e., a dialog) has been added to get input from the user. The main procedure is more detailed than shown in this article, to accommodate this dialog, and to compile data selectively. I enjoy doing this kind of project. Even with the ribbon components and the dialog, it only takes a few hours. If you need something like this done, send me your requirements and I’ll generate a quote. Posted: Tuesday, February 12th, 2019 under Utilities. Peltier Tech Charts for Excel has been updated to Build 3008 3009, on 11 April 2016 17 April 2016. If you are using an earlier build and you want to update to 3008 3009, send me an email. Note: A minor bug was added in Build 3008 and an old bug was supposed to be fixed but wasn’t. Build 3009 remedies this and adds a bit of flexibility to box plot source data. This is not a major upgrade, but it seems like more than a minor one. 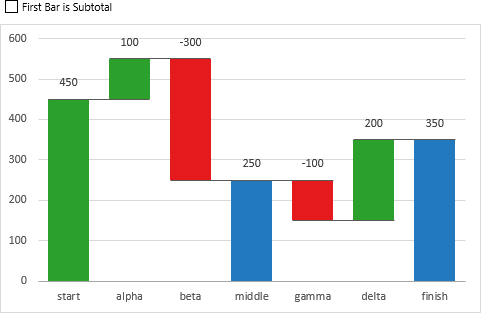 There are big enhancements to Waterfall and Rotated Waterfall charts, there are new chart resizing and alignment features, and Loess Smoothing can now perform moving quadratic regression. There are no new chart types in this update, but there are major enhancements to some existing charts. 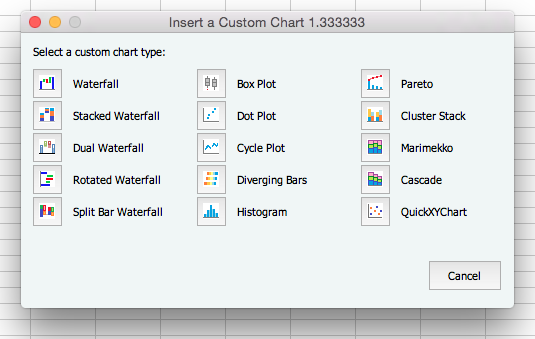 The Waterfall Chart dialog has been changes, with a new “First Bar” setting and updated “Value Labels” settings. These are described below. When selecting data, if you choose to output the chart on a new worksheet, you are allowed to use non-contiguous data ranges. For example, you could select category labels in the range A4:A12 and values in the range C4:C12. If you create the chart on the active sheet, the data still must be in adjacent columns. When the waterfall chart is created on a new worksheet, the data and calculations are placed in an Excel Table. This makes it easier for you to modify the data, by inserting or removing table rows. Placing the output into a Table will also make it easier for me to build versions of Peltier Tech Charts for PowerPoint and Word. I hope to have these available in a few months. Regardless of the output location of the chart, the two new chart features are available from the dialog and also using the checkbox or listbox next to the output range. The Waterfall Chart changes apply to both the Standard and Advanced Editions of Peltier Tech Charts for Excel 3.0. 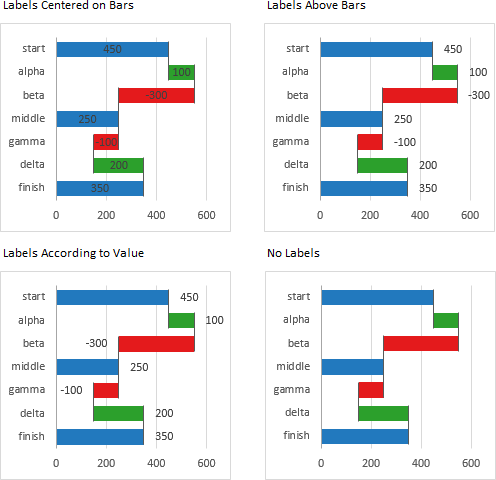 Rotated Waterfall Charts have been enhanced in the same way as regular Waterfall Charts. When the rotated waterfall chart is created on a new worksheet, the data and calculations are placed in an Excel Table. This makes it easier for you to modify the data, by inserting or removing table rows. 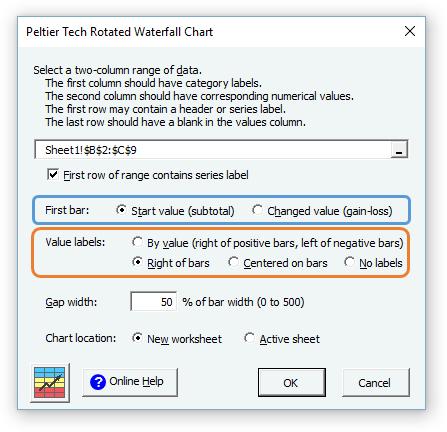 The Rotated Waterfall Chart changes apply only to the Advanced Editions of Peltier Tech Charts for Excel 3.0. 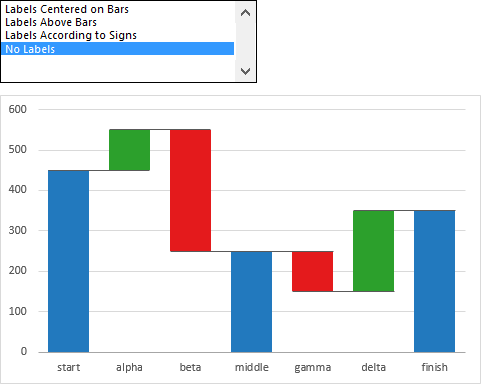 A few features have been added to help you resize and align charts. These can be found in a new dropdown on the Move and Resize Chart Elements button on the Peltier Tech ribbon. Here are some typical charts of various sizes and positions before using the new features. 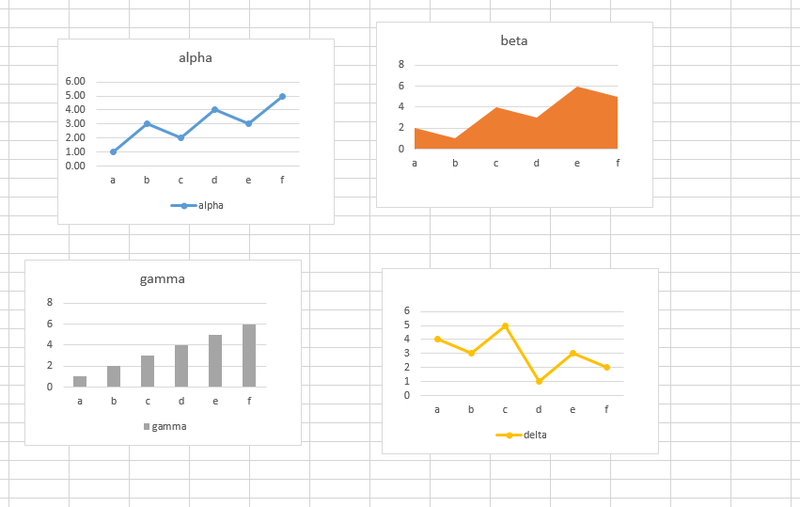 Resize Charts makes all of the selected charts the same size as the first selected chart, without moving any of the charts. Resize and Align Selected Charts makes all selected charts the same size as the first selected chart, and arranges them in a grid with the first selected chart serving as the top left chart in the grid. A small dialog asks how many charts in each row of the grid. Resize Charts and Margins makes all selected charts the same size as the first selected chart, without moving any charts. The interior plot areas of the charts are all resized so all charts have the same margins around the plot areas. Note that the bottom right chart has a margin for its missing title, and the top right has one for its missing legend; all charts have a wider left margin matching the first chart’s longer axis labels, and the blank right margins all match up. 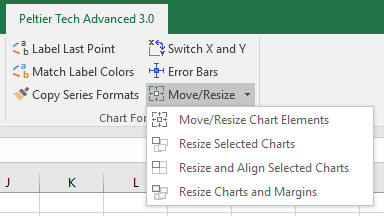 These chart resizing features apply only to the Advanced Editions of Peltier Tech Charts for Excel 3.0. There is now an option to use a quadratic weighted moving regression as a basis for Loess smoothing. 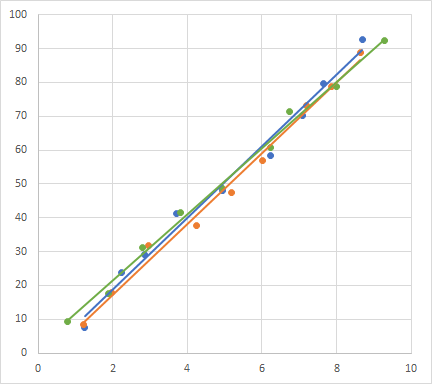 Quadratic regression takes slightly longer to calculate, but it may result in the smoothed line being closer to the middle of the input points. Curvature in the input data is smoothed more closely, especially at the ends of the input data. 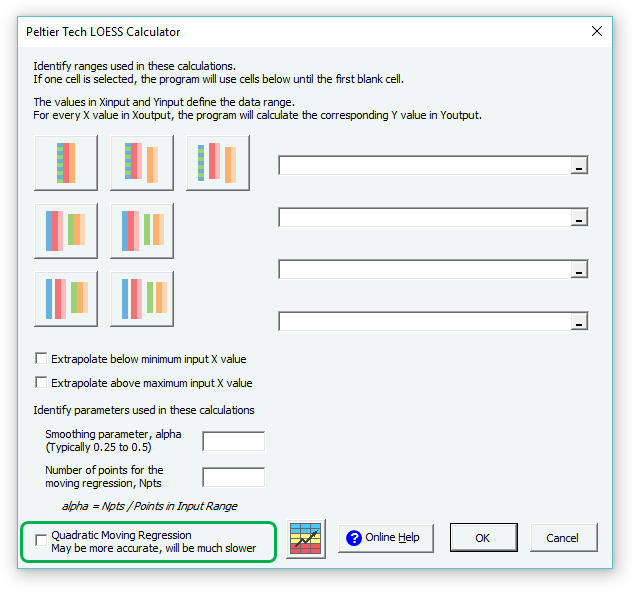 This update to the Loess Smoothing feature applies only to the Advanced Editions of Peltier Tech Charts for Excel 3.0. Posted: Tuesday, April 12th, 2016 under Utilities. Peltier Technical Services is pleased to announce the newest version of its landmark charting utility. If you have a valid license to any version of the Peltier Tech Chart Utility 2.0 (Advanced or Standard, Windows or Mac), you are eligible for a 50% discount, on top of the $10 discount above. Email Peltier Tech for a discount coupon. If you have a valid license to any of the older standalone Peltier Tech Whatever Chart Utilities (Waterfall, Cluster-Stack, Box Plot, etc. ), you are eligible for a 25% discount, on top of the $10 discount above. Email Peltier Tech for a discount coupon. If you’ve licensed the Peltier Tech Chart Utility in the past month or two, email Peltier Tech and we’ll work out a fair price for an upgrade. There are several major changes and a lot of minor ones. First, the utility has been updated to run in Excel 2016 for Windows (out next week) and for Mac (out last month). Second, the same add-in can run in both Windows and Mac. In the past I had to support two different files, because of incompatibilities between Windows VBA and Mac VBA. But I dug into all of these incompatibilities and found ways around them. Users can now license the utility once and use it on both platforms. Third, I’ve added a feature to the advanced version of the utility that summarizes your chart’s data, lets you select some or all series in a chart, then moves or resizes their data ranges by a number of rows or columns or to a different sheet in a single operation. I built it for myself, then decided people might like it, so I put it into the program. 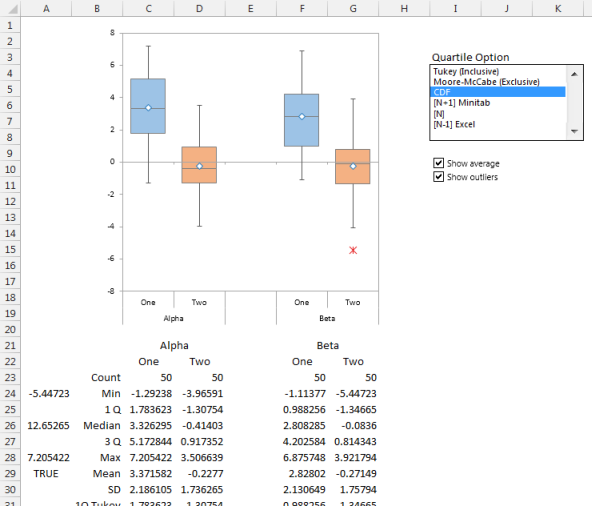 Fourth, I’ve added one new chart type, Clustered Box Plots. This is a nice enhancement to box plots, allowing categories to be grouped and color coded to show patterns more readily. Although Peltier Tech Charts for Excel has been released, there are more things being done to it. First, there is still a lot of testing to be done in Excel 2016 for Mac. A lot of bugs and inconsistencies have been addressed, but there are still incompatibilities, and there are features that need more development. Exporting charts as image files, for example, which is a victim of an increasingly harsh lockdown by Apple on its hardware. Second, there are a lot more features, both chart types and other functions, under development. Tornado sensitivity charts, Gantt charts, panel charts, step charts, and run charts. Features to clean up charts, arrange charts and chart elements, extract chart data, quickly apply favorite series formats. Third, under development are versions of this software that work directly in other Office applications, linking to your Excel data, but building charts in PowerPoint or Word. If you have a valid license to any version of the Peltier Tech Chart Utility 2.0 (Advanced or Standard, Windows or Mac), you are eligible for a 50% discount, on top of the $10 discount above. If you have a valid license to any of the older standalone Peltier Tech Whatever Chart Utilities (Waterfall, Cluster-Stack, Box Plot, etc. ), you are eligible for a 25% discount, on top of the $10 discount above. If you are a user of any previous Peltier Tech product, email Peltier Tech for your discount coupon. Posted: Friday, September 18th, 2015 under Utilities. Microsoft Office 2016 for Mac and Microsoft Office 2016 for Windows have been released over the past couple of months. Peltier Tech Chart Utility 2.0 (the current version) will not work in the commercial release of Office 2016, though it may load in Previews. Peltier Technical Services has released an upgraded utility, Peltier Tech Charts for Excel 3.0, to correspond with the upgrade to Microsoft Office. Peltier Tech Charts for Excel 3.0 will work in Office 2007, 2010, 2013, and 2016 for Windows and Office 2011 and 2016 for Mac. Note that Office 2007 for Windows will no longer be “officially” supported after Microsoft’s Extended Support End Date of 10 October 2017, though the utility should still run fine. In the past, the Peltier Tech Utility had separate add-ins for Windows and for Mac. Users of both platforms had to purchase both add-ins (at a discount, of course). In contrast, the Peltier Tech Charts for Excel 3.0 will have a single add-in that runs equally well in both operating systems. 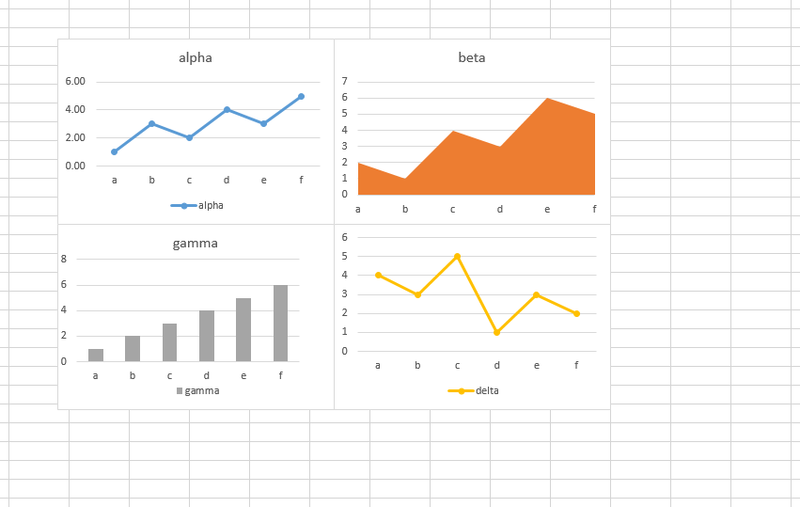 There will be a PowerPoint edition of Peltier Tech Charts for Excel 3.0, running right in PowerPoint. 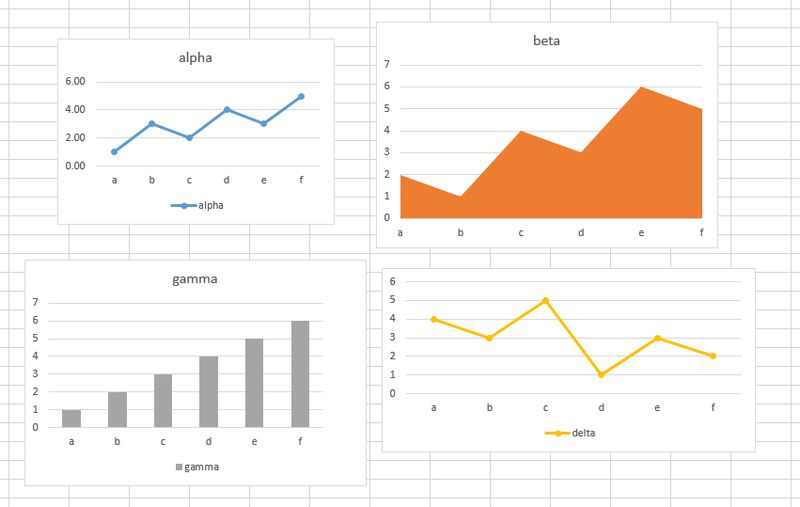 You will be able to insert and modify great charts right in PowerPoint, using your Excel data or entering your own in the PowerPoint chart’s datasheet. 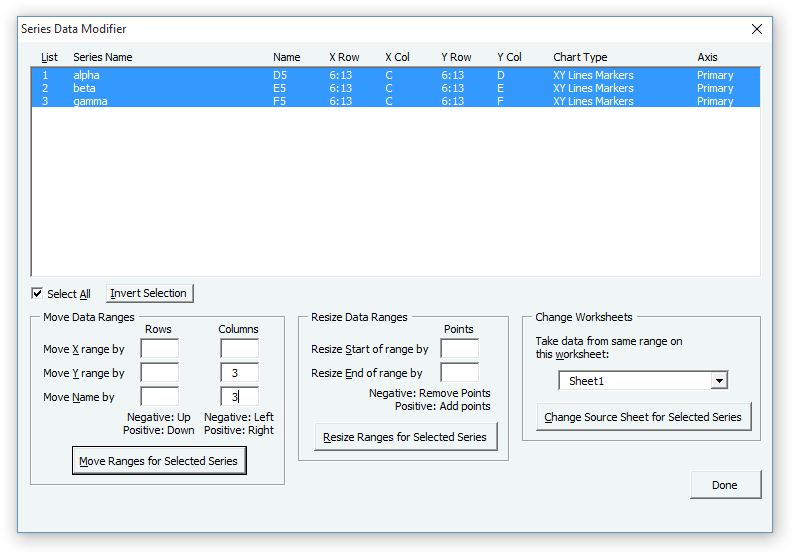 There may also be a Word edition of Peltier Tech Charts for Excel 3.0. Non-Excel versions of the utility will be available some time after the Excel version, and will be described elsewhere. Peltier Tech Charts for Excel 3.0 is not just a new number assigned to the same old program. There will be many new charts and features. The upgraded utility will add simple Controls Charts. These will not replace the superb Statistical Process Control packages available for Excel, but they will satisfy the needs of users who only want a few simple run charts. The utility will also introduce Grouped Box Plots, allowing multiple color-coded groups of boxes and whiskers. Even though Microsoft Office 2016 will offer Waterfalls, Paretos, Histograms, and Box Plots (finally, right? 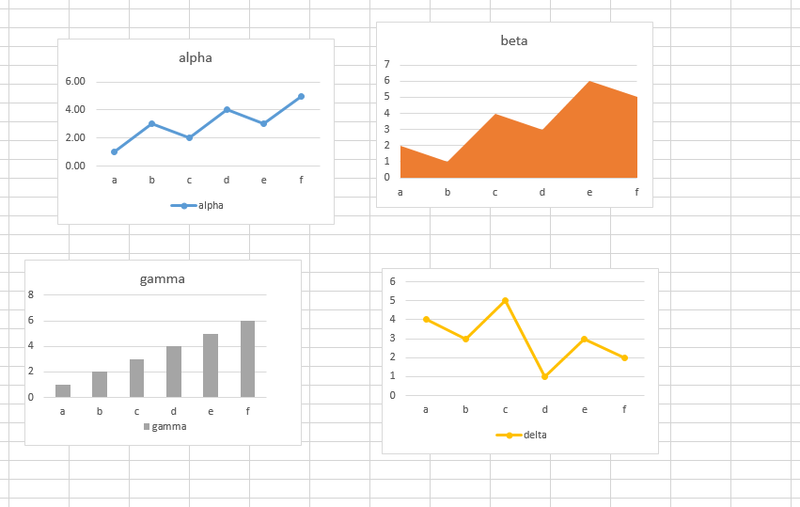 ), the Peltier Tech Utility will continue to offer these charts, for consistency and for users who are still using Excel 2013 and 2010. Something missing? Tell me about it. 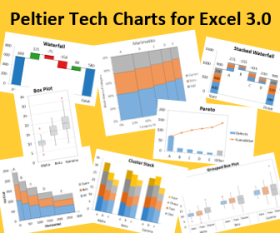 There are Standard and Advanced Editions of Peltier Tech Charts for Excel 3.0. The Standard Edition has a lot of great custom charts and features, and the Advanced Edition has twice as much. A few features now found in the Advanced Edition may be migrated to the Standard Edition. New features developed during the Beta program and later will be introduced to the Advanced Edition. The Peltier Tech Charts for Excel 3.0 Beta program has concluded. 3. If new buttons don’t appear on a new Add-Ins tab, restart Excel, and they will become available. This glitch will be fixed when Microsoft finishes making the Mac ribbon fully customizable, sometime over the next few weeks or months. The Peltier Tech Charts for Excel 3.0 Add-ins tab in Mac Excel 2016, showing (top to bottom) Main, Chart Data, Chart Format, Export, and Misc toolbars. This arrangement of multiple toolbars was necessitated because Mac Excel 2016 does not yet support a custom ribbon tab, yet it no longer supports custom menus. Click the image above to view full-size in a new browser tab. 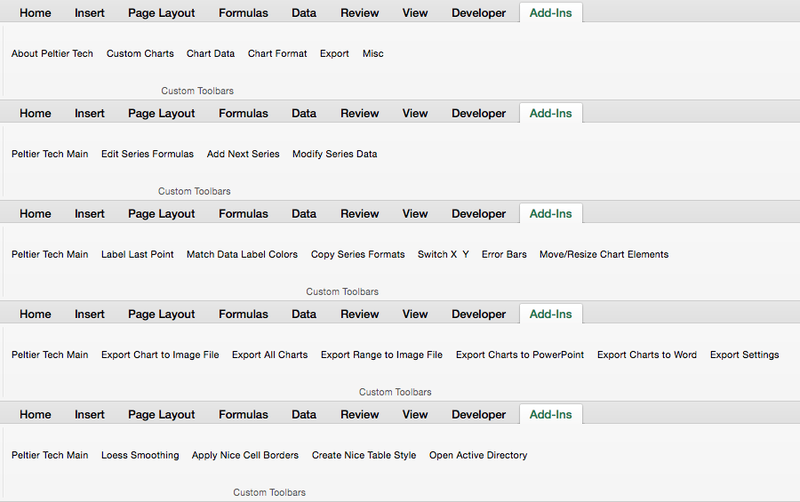 Below is the dialog for selecting a specific custom chart type, full size. 3. A menu will appear on the main Excel menu bar at the top of the screen, without the need to restart. 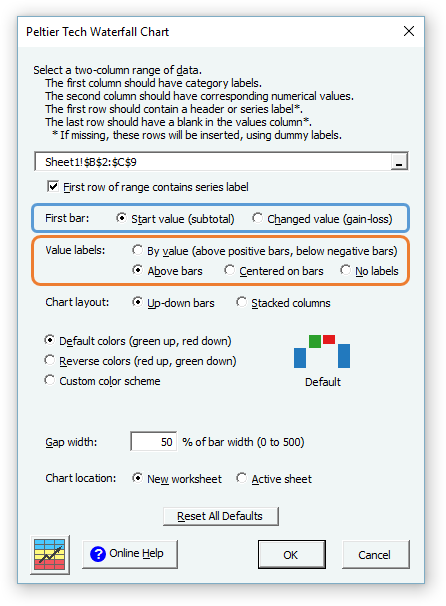 The Peltier Tech Charts for Excel 3.0 Menus in Mac Excel 2011. Click the image above to view full-size in a new browser tab. 3. 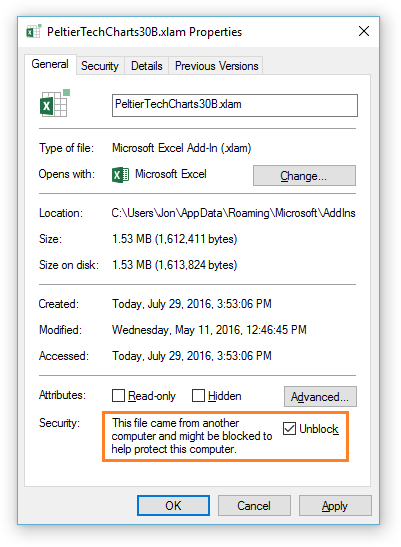 A Peltier Tech tab will appear on the Excel ribbon, without the need to restart. The Peltier Tech Charts for Excel 3.0 Ribbon in Windows. Click the image above to view full-size in a new browser tab.We expect that Excel 2016 for Mac will closely resemble this ribbon. Find a bug? Think of a feature that is missing? Mention it in the comments below. Include details like which version of Excel you’re using, what feature you were trying to use, what you expected to happen, and what did happen. Include error messages (the text of the message, not just the number). If I contact you I may ask for a screenshot of the error, and a copy of your data including the problematic output. Include your email when posting your comment. I’m the only one who can see it, so it will help me follow up but will not let anyone else spam you. Existing users of Peltier Tech software will get a healthy discount for upgrading. Send an email to Peltier Tech to request a coupon code for your discount. Posted: Monday, August 10th, 2015 under Utilities. Tags: Excel 2016, Mac and Windows. 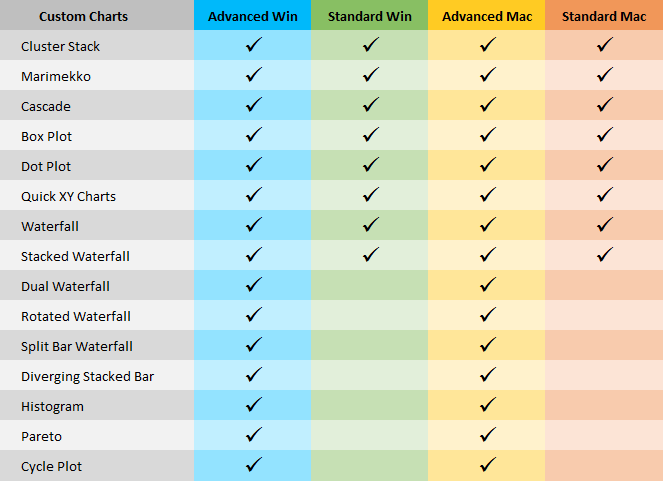 The Peltier Tech Advanced Chart Utilities for Mac is here. Over the past month a month, I’ve converted the Advanced Edition of the Peltier Tech Chart Utility so that it works on a Mac as well as in Windows. I’m pleased that every feature from the Windows version has made it into the Mac version, though some options are not available. This is due mostly to the inconsistencies between Office on the Mac and Office in Windows, such as the unavailability of modeless forms and the reduced selection of Paste Special options in MacOffice. A few differences relate to incompatibilities between the two platforms themselves, such as the strange special keys and special key behavior on the Mac (somehow the Mac’s Cmd-Ctrl-Opt-Shift keys provide less functionality than Windows’ Ctrl-Alt-Shift). The lack of a customizable ribbon in Mac Office means the user experience is less fulfilling than in Windows. The Advanced Edition for the Mac has all the custom charts as the Standard Version for the Mac and for Windows: Waterfall, Box Plot, Marimekko, Cluster-Stack, etc., and all the new charts introduced last month in the Advanced Edition for Windows: More Waterfalls, Diverging Stacked Bar, Paretos and Histograms, and more. In addition to the charts shown here, any new custom charts developed by Peltier Tech will become part of the Advanced Edition. If you hear from the Peltier Tech twitter feed, the Peltier Tech Facebook page, or the Peltier Tech Blog that a new chart has been added (or a bug has been fixed), email for a new download link so you can keep your license up-to-date. 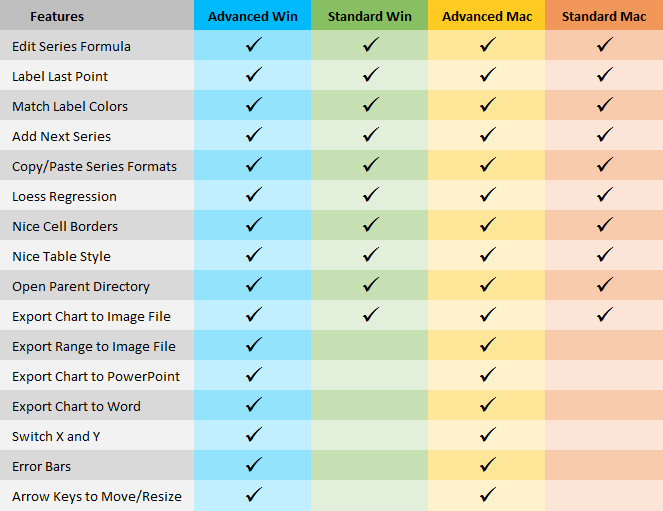 In addition to the helpful features of the Standard Edition, such as Edit Series Formulas, Copy and Paste Series Formats, Label Last Point, and Export Chart as Image File, the Advanced Edition adds such items as Export Range as Image File, Export Charts to PowerPoint and Word, Switch X and Y, and a simpler Error Bar Manager. In addition to the features shown below, any new functionality developed by Peltier Tech will be added to the Advanced Edition. If you hear via the Peltier Tech twitter feed or the Peltier Tech Blog that a new feature has been added (or a bug has been fixed), email for a new download link so you can keep your utility current. The Advanced Edition for the Mac runs on the latest updates of Excel 2011 for the Mac, and the relevant versions of the Mac OS that supports Excel 2011. If you purchase a license for the Advanced Edition between July 8 and July 15, you get it for the same $79 price as the Standard Edition. If you already have a license for the Standard Edition, send me an email and I will send you a coupon code for a free upgrade to the Advanced Edition. In the future, you can upgrade from the Standard to Advanced Edition for only the $20 difference in price. If you have licensed one of the earlier Waterfall or Cluster-Stack Utilities for the Mac, email me and I’ll send a coupon for half off the $79 introductory price. In the future, if you have licensed any of the older utilities, email me for a half-price coupon. When Microsoft releases the long-awaited Excel 2014 for Mac, the Peltier Tech Utility for Mac will be updated, and current licensees will be able to upgrade for no charge. When Microsoft releases Excel 16 for Windows (probably a/k/a Excel 2016 or 2017), the Peltier Tech Chart Utility will be upgraded, and current licensees will as always be able to license the upgrade for half price. Visit the Peltier Tech Chart Utilities page to take advantage of these special offers. Posted: Tuesday, July 8th, 2014 under Utilities. Tags: Macs and PCs, Utilities.